Absolutely PRISTINE and MODEL PERFECT home on small cul-de-sac in highly desirable Northbridge Point! This IMMACULATE 4 bedroom home sits on a flat cul-de-sac with 5 other homes, right next to a paseo entrance! Super sharp and move-in ready with recently refinished wood flooring throughout downstairs and plush BRAND NEW carpeting upstairs! Full downstairs bed & bath as well as formal living & dining areas with 20 foot ceilings and large windows! Kitchen/family room open to each other and feature granite counters, stainless appliances, brick fireplace and ceiling fan. Upstairs master suite and 2 secondary bedrooms. Gorgeous stairway is a focal point of the entry with wrought iron balusters. The backyard is a gardeners delight with mature landscaping and covered patio. The vegetation extends about 2 feet above the block walls creating an amazing sense of privacy! 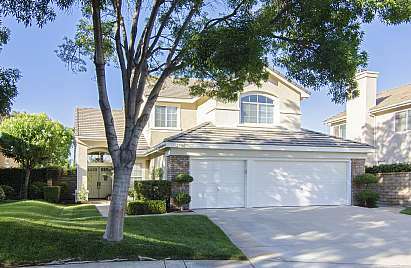 The 3 car garage is meticulously maintained and offers plenty of great storage AND parking space! Every last detail in this home has been attended to, you won't believe that someone actually lives here! With its ideal location, tasteful upgrades and absolutely perfect condition this home just begs for you to move right in!